No surprises this week, although it is probably worth pointing out how the 0day robot has been getting even better (it was very useful before, but Fengguang has been working on making it even better, and reporting the problems it has found). Sure, some of the new reports turned out to be just 0day doing things that just don’t work (ie KASAN with old gcc versions, but also doing things like loading old ISA drivers in situations that just don’t make sense – remember when you couldn’t even ask if the hardware existed or not, and just had to know), but even then it’s been all good. The appended shortlog is obviously only for the (small) haul since rc8, and it really is tiny. Not very many commits, and they are small. The biggest thing that stands out in the diffstat is the “leaking_addresses” perl script, which is actually under active development, but I put the first version in for 4.14 just so that people could see that initial state and start looking at the end result and perhaps ask themselves “should my code make these kernel addresses visible to user space”. The actual changes will hopefully start percolating into 4.15, with one notable likely early change (which has been discussed extensively on the list) being to just hash any “%p” addresses by default. We used to have strict modes that just zeroed the address out, but that was actually counter-productive, in that often people use the address as a “kernel object identity” for debugging (or for cross-correlation -think network sockets), and so just clearing the pointer value makes those kinds of uses pointless. But using a secure hash allows for those kinds of identity uses, while not actually leaking the address itself. (Other situations where the actual address is relevant then need other approaches – we’ll be restricting /proc/kallsyms only to entities that actually need them etc etc). Anyway, apart from that one script, the rest of it really is one-liners or “few-liners”. The most noticeable last-minute change is probably that we had to revert the code that showed a good MHz value in /proc/cpuinfo even for the modern “CPU picks frequency dynamically” case. It worked fine, but it was much too expensive on machines with tens or hundreds of CPU cores. There’s a cunning plan, but it didn’t make 4.14, so we’ll get it working and then back-port. And with this, the merge window for 4.15 is obviously open. As mentioned in the late rc announcements, the extra week for rc8 means that now Thanksgiving week ends up happening during the second half of the merge window, and I’ll be off on a family vacation. I might decide that I’ll extend the merge window if I feel that I can’t be responsive enough. Or maybe you guys won’t even notice, because I _will_ have my laptop and Internet access. Or maybe I will just decide that 4.14 was a painful release, and any late stragglers for 4.15 are not worth _another_ painful release, and I’ll just say “tough luck, you were late to the merge window, and I felt more like being out in the sun than taking your second-week pull request”. Anyway, go out and test the new 4.14 release, that is slated to be the next LTS kernel – and start sending me pull request for the 4.15 merge window. Linux 4.13 brought us new features such as support for non-blocking buffered I/O operations at the block level, AppArmor security module’s “domain labeling” code, kernel-based TLS implementation for better performance, and CIFS/SAMBA default change to v3.0 for better security, among many other changes. Bigger memory limits – x86-64 used to be limited by 4-level paging to 256 TiB of virtual address space and 64 TiB of physical address space. Some vendors already reached the limit with servers equipped with 64 TiB of memory, so support for 5-level paging has been introduced, increasing the limits to 128 PiB of virtual address space and 4 PiB of physical address space. Added AMD Secure Memory Encryption – Secure Memory Encryption can be used to protect the contents of DRAM from physical attacks on the system. Read LWN article or AMD whitepaper for details. Compression in Btrfs and Squashfs – zstd compresses at speeds close to lz4 at compression ratio comparable to lzma. Support for zstd compression had been added to both Btrfs and Squash. See benchmarks in commit messages for Btrsfs and Squashfs. Zero-copy from user memory to sockets – The MSG_ZEROCOPY socket flag enables zero copy mechanism to common socket send calls. It is generally only effective at writes over around 10 KB. Checkout the documentation for more details. removal of the deprecated num-slots property from dwmmc nodes. RK3368 – support for spdif. RK3399 – pcie changes, support for the mali gpu, a new power-domain, sdmmc support on the firefly board and dynamic-power-coefficients. RK3288 – EVB gains support saradc and the adc-key, mali gpu enabled in some boards (fennec, evb, tinker). Remove deprecated and unneeded properties from Exynos boards. Implement proper (working) support for USB On-The-Go on Exynos5433 TM2/TM2E boards. Enable some drivers useful on our boards (communication: Bluetooth, WiFi, NFC, USB; codepages and crypto algorithms). Enable debugging and lock testing options. V4l – Update the Qualcomm Camera Subsystem driver document with a media controller pipeline graph diagram, VFE scale and crop modules support, and PIX interface and format conversion support. Pinctrl driver – Mediatek MT7623 PCIe mux data fixed up. Mediatek/Ralink – Add Mediatek MT7628A SoC, allow NULL clock for clk_get_rate, explicitly request exclusive reset control in the pci-mt7620 PCI driver. 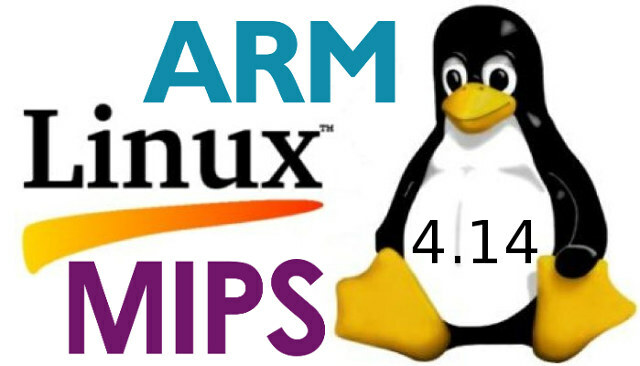 For the complete details, you could check out the full Linux 4.14 changelog – with comments only – generated using git log v4.13..v4.14 --stat, or – kinder to your eyes – read kernelnewsbies’s Linux 4.14 changelog. Sweet JC, I ask who need this!! I’m curious if there is a performance impact from this and how bad it will be. Is it an option or is all x86-64 going to be 5 level all the time? You only need consider the massive quantities of data extracted from telecommunications networks that the NSA has to sift in order to identify thought-criminals and potential terrorists to realize just how necessary are these improvements to memory limits. A supercomputer is a computer with a high level of computing performance compared to a general-purpose computer. Performance of a supercomputer is measured in floating-point operations per second (FLOPS) instead of million instructions per second (MIPS). As of 2017, there are supercomputers which can perform up to nearly a hundred quadrillions of FLOPS, measured in P(eta)FLOPS. The majority of supercomputers today run Linux-based operating systems. Cryptanalysis (from the Greek kryptós, “hidden”, and analýein, “to loosen” or “to untie”) is the study of analyzing information systems in order to study the hidden aspects of the systems. Cryptanalysis is used to breach cryptographic security systems and gain access to the contents of encrypted messages, even if the cryptographic key is unknown. GR8 hangs immediately after “Starting kernel …” (u-boot). Pitty. Linux 4.14 will be an LTS kernel supported for 2 years, not 6 years as previously stated. For now, only Linux 4.4 is to be supported for 6 years.